We are excited to share a summary of the event held in July 2018—Leading and Working Toward Equity: Leadership Summit—including some attendee reflections and actions from after the event. Convened through the generous support of the W.K. Kellogg Foundation, the summit was hosted by the Governing Board of the National Association for the Education of Young Children and facilitated by the National Equity Project. It brought together leadership from NAEYC’s governance structure—affiliates, interest forums, advisory councils, staff, and the entire national governing board. Each entity selected its representatives for the experience. The three-day work session provided multiple opportunities for field leaders to grapple with their perspectives regarding equity and diversity and to reassess their own approaches to creating more equitable learning opportunities for their NAEYC organizations, paid staff and volunteers, and early childhood educators—and ultimately for the children and families who depend on them for high-quality education and care. The Leadership Summit was one part of NAEYC’s multipronged, continuous effort to become a more diverse, high-performing, inclusive organization serving a more diverse, high-performing, and inclusive field. 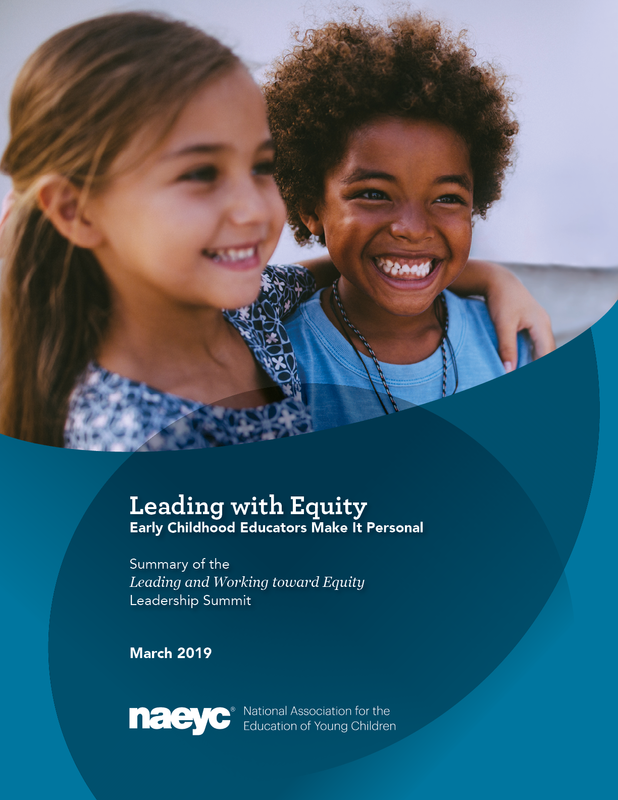 This report summarizes the discussions and looks at the next steps for NAEYC to take toward advancing equity and diversity. We hope you will read the report, share it with others, and commit to working with us to continue the work! Become a consulting editor for NAEYC’s publishing team. Amy O'Leary serves as President of the NAEYC Governing Board. Advancing Equity: Read our draft Position Statement & Summary on the Equity Leadership Summit!